Please fix the vision in this game. We need either a ARMA like zoom that can be used at any time or we need major adjustments to rendering scale at range. The current game makes seeing distant enemies, especially when standing in the open, way too difficult. Contrast needs work as well. The degree to which camo works right now is absurd. All of these things combined are creating a game where the combat is being compressed into much smaller areas than it would be for a given terrain type. It additionally makes the value of optics FAR too great. In real life optics are a huge factor, but personnel with iron sights are not next to useless like they are now. This is not a small deal. The current state of vision in the game alters tactics to a great extent from what they would be in real life. I also what to make it clear that my view on this is not a matter of opinion, at least with regards to how this game currently stacks up to real life vision. The developers view on how to make their game IS a matter of opinion, and one which they obviously have every right to do as they please. BUT if you want to make this game CORRECT, then vision needs fixed. ----My source regarding my views on vision is that I do this in real life as a 12B. It is several orders of magnitude easier to see distant contacts in the real world than it is in squad right now. Not just slightly easier, WAY easier. As in Night/Day difference. In real life, a target at 1000m is easier to see than a target at 300m in this game. Didnt know combat engineers would be targeting enemies at 1000m. I do agree though. Fix the visibility. I have mixed feelings about your statement. I do agree that roles limited to Iron Sight are less effective at medium/long range engagements which is why there are other roles equipped with optics that can be substituted in for. This forces the squad to work together as each role has their pros/cons and some are better suited for these long range engagements than others. At the end of the day it all boils down to balance so a compromise has to be made somewhere to allow for a greater cooperative team play between players. If a player with Iron Sight can accurately engage at 1000m then why do we have marksmen and ACOG sights? I have advocated in the past (among many others) to add an optional red dot for the roles with Iron Sight across most if not all factions. I understand it wouldn't necessarily correct the vision problem you brought up but we can all agree that it would help a whole lot. All in all I agree that Iron Sights should be a bit more effective at long range engagements but considering it's technically still in Alpha the devs might come around and change the view distance issue who knows. Please don't confuse a game's big shortcomings with planned balance features. There's a huge middle ground between not being able to see a target and being able to effectively engage. I did not say that shooting a target at 1000m should be easy. Where did you get that idea? This post is also about spotting, not aiming. At the end of the day balance is irrelevant. But what you say does not follow regardless. Optics exist so you can engage at even further distances. Being able to spot at longer ranges without optics does not mean that the optic will somehow become irrelevant, but their extreme utility will diminish. You should not need an optic to engage a target at 300m, much less see one. As squad is right now 250-500m is "extreme" long range, which is absurd. Adding red dots to all factions is a bad idea because IRL not all these factions have them. I dont want armies or factions having gear they dont really have. Completely deletes the point of using IRL factions and armies. What vision in games used to be like. This is a unzoomed image from the old Project Reality. EQT quals for mechanized unit. Dismounts are generally engaging only out to 500m or so but there are infantry targets out past 1000m, usually engaged by other weapons. You hardly need optics to see them. No. We need more zoom, not less. ALOT more zoom. I agree from a realism standpoint, but not gameplay standpoint. Yes IRL you can see things better and even engage them more accurately. HOWEVER, we DON'T WANT realistic gameplay in Squad (as in, walking for hours to get sniped from 800m away). The Arma series has that already and there is a reason most people can't be bothered to suffer through it. I'm cool with the current, roughly halved sight/engagement ranges in order to get actually fun gameplay. Otherwise, what you get is roughly tripling the walking time and making the asymmetric maps (regular vs irregular factions) largely unplayable. HOWEVER, we DON'T WANT realistic gameplay in Squad (as in, walking for hours to get sniped from 800m away). The Arma series has that already and there is a reason most people can't be bothered to suffer through it. I'm cool with roughly halving the sight/engagement ranges in order to get actually fun gameplay. Otherwise, what you get is roughly tripling the walking time and making the asymmetric maps (regular vs irregular factions) largely unplayable. You may not want this, but I doubt thats the case for the rest of the community. Squad is a successor to PR, which very much had realism as its goal. -And ARMA also has concessions to "gameplay," just like every game ever......which means its nonsense to say that because squad does this the focus should not be realism. @Hvolute I understand your frustration but I'm under the impression that you're too focused (pun intended) on the spotting mechanic rather than the overall gameplay as a whole. 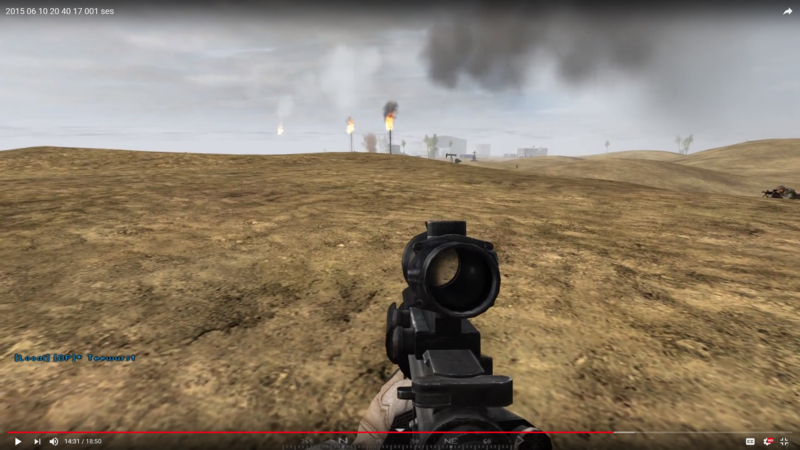 I agree that spotting an enemy at 500m-1000m and consequently engaging it at those distances may be more feasible in real life as opposed to the way it's implemented in the game currently. Especially when it comes to figuring the location of an enemy marksman that has his crosshairs on you but that's where the other roles in your squad come in handy. Your Squad Leader has binoculars, your marksman squad mate has his own long range rifle and optic to engage those targets you can't necessarily see with your Iron Sights / Red Dot. As much as you're fired up about this subject just try to take a step back and look at the beauty of what OWI has done so far and accept the fact that some roles are better suited for medium/long range engagements than others. Contrary to your personal convictions on this matter, it does boil down to balance and is very much relevant. That being said I'm curious to know what the devs have to say about this issue. Are they content with the current spotting mechanics? You fail to understand just how big of a deal this is to gameplay and realism. Visibility literally changes everything. Its being to great to to little completely alters tactical needs. So no, Im not too focused. "As much as you're fired up about this subject just try to take a step back and look at the beauty of what OWI has done so far and accept the fact that some roles are better suited for medium/long range engagements than others. " The above quote is a pointless and inane statement that lends nothing constructive to this conversation. It essentially reads: "why cant you just shut up and accept how awesome squad is?" I can do without such drivel. Balance is not relevant. I could care less how badly off a team is due to their weapons systems. It it ends up being a curb stomp because one side has optics and another does not, then so be it. There is zero point what so ever of modeling real world military forces if you are not going to model them as true to life as can be done. You might as well just make up fictional nations if your not going to flavor a nation corresponding to its real world character. - Magic Team Spawn (HAB). - Magic Squad Spawn (Rally). - Not to mention playing with your monitor and audio settings to better bring out Gamma and better audio discrimination of effects. - NOT BEING ABLE TO SWIM? I think they need to make it a bit easier to see enemies at a distance... But not the way you describe it. Just slightly so that you could spot them if you actually pay attention at 500-1000 metre range maybe..
-Mortars should be fixed, obviously. -Reloading isnt a fixed value IRL. Many people do in fact take a long time to reload, especially if you are not discarding the magazine. -swimming isnt a particularly important aspect of warfare. So its accuracy makes little difference, and is therefore not worthy of discussion. -The nature of supplies in game is well outside the scope of the games practical environment and manpower abilities, so abstraction is necessary. -HAB spawning is also a necessity, since real life reinforcing and assembling is outside of scope of what can be done in any game. In actual fact, the HAB is a step toward more realistic spawning since it does much to alleviate the problem most other shooters have with constant waves of body throwing to take objectives. HAB's limit spawn options, cant be destroyed, and also push back the proximity of spawns to the front line. Which is a hell of alot better than fixed spawns right on top of defensive points. -The rally point is obviously not a real thing. I could live with or without it, since I dont feel that it affects tactics too much. The problem with vision is that it is a HUGE mechanic that affects many different things at once. It is also FIXABLE to a greater degree than exists in game. It greatly affects tactical considerations to a degree where not getting it close enough to reality makes a mockery of trying to simulate anything at all. Vision is not some piddly thing, it is one of the end all be all mechanics. What you do not seem to understand is that when you are making a "realistic" game, not all abstractions are equal. This should be painfully obvious. Some abstractions exist because its impossible to do a 1 to 1 sim of the thing in question. Some exist because they add to the fun WITHOUT unduly compromising the goal a realism, and so on an so forth. What you are trying to rather inanely assert is that we should treat all game abstractions as equal, and therefore analogously use that as excuse to vacuously interpret which mechanics are critical and which ones are not. The current state of the vision in this game is one of the WORST examples in ANY game, realism oriented or not. Just about everything over 250m disappears or is too hard to pick out without optics or unreasonable observation times. There are arcade shooters that do a better job. And it is a huge deal because not only is an error on its own, but it practically obliterates the function of many other items in game. It craps on the game so much that just about everything else the devs do is pointless because the current vision system proportionally takes a weed wacker to every other realistic item in the game. Except this is not how it is IRL. Someone walking at 600m, even with their back to a hill of grass, is easy as crap to spot. You will notice it without trying so long it is not low light. obviously not, since a scope will still give you even more zoom. Just like it does IRL. Dude you're giving off major vibes of dissatisfaction, to say the least, in regards to spotting. I agree with @Guan_Yu007 that it needs to be improved but only slightly. Having to rely on your squad to move together and work together is much more rewarding then a possible situation that can arise from a major buff, such as what you're suggesting here, where we'll see more lone wolves because they'll then be able to spot and engage without the help and support from their team mates. The more emphasis on squad movements to accomplish goals the better off the results. Stay close to your squad, communicate and engage targets that others have spotted and have fun. Also, suppression is a thing. Dude you're giving off major vibes of dissatisfaction, to say the least, in regards to spotting. PR had decent spotting, and it didn't result in lone wolf syndrome. You dont enforce player behavior at the expense of game mechanics. PR, the predecessor to squad, enforced team play by strict team enforcement. Dont want to play in a squad? You get booted form the server. Join a squad and dont stay with your team? You get kick from the squad and then booted for not being in one. Simple.